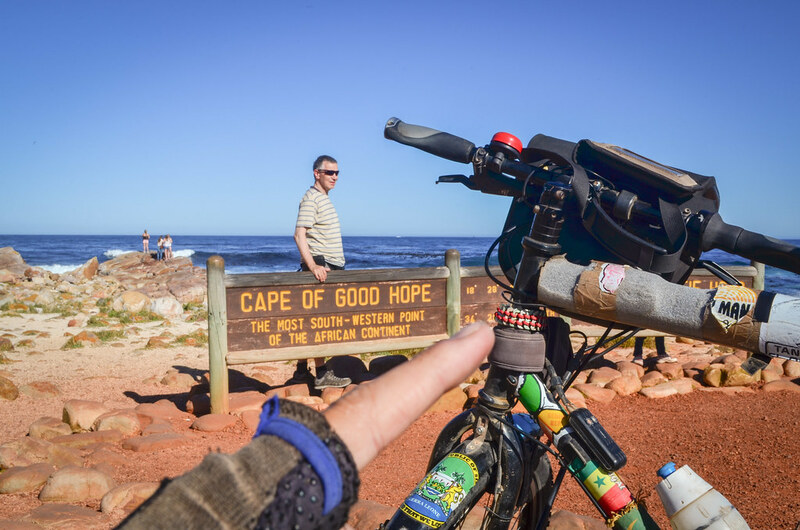 Cape of Good Hope success! An お守り omamori is a talisman sold in Shinto temples and some other religious or pseudo-religious places. Written onto it are the name of the temple and its purpose: safety, pregnancy, good fortune, etc. While in Japan, I played the game like everyone else. For example, before taking my entrance exam at Kyoto University, like many other students, I went to 北野天満宮 Kitano Tenmangu and wrote my 絵馬 ema, a votive wooden tablet to be left hanging at the temple. 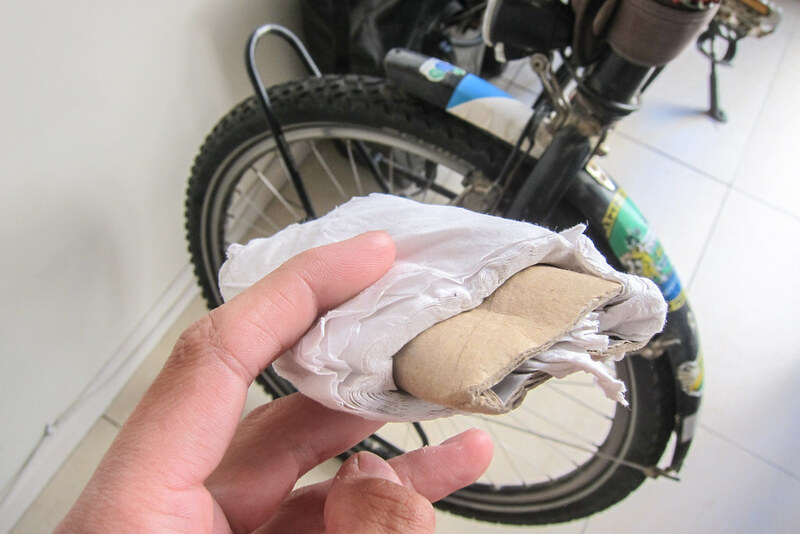 Also, when cycling around the country, I had an omamori hanging on the front basket of my then “touring bicycle” (a single speed bicycle with almost no luggage). Visiting temples is a sightseeing activity that can’t be avoided in Japan, so it’s easy to end up with many Shinto and Buddhist souvenirs. 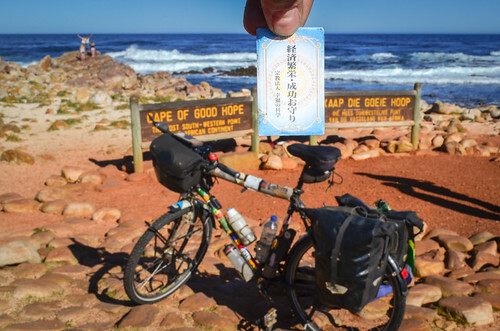 Since I have completed all my previous cycle touring trips successfully and with no injury, just a few breakdowns that I eventually dealt with, I thought I should get an omamori for this African trip too. And MiTori brought me this 成功 seikou お守り omamori, the talisman for success. But this is not the only non-functional piece of equipment I’ve had with me. 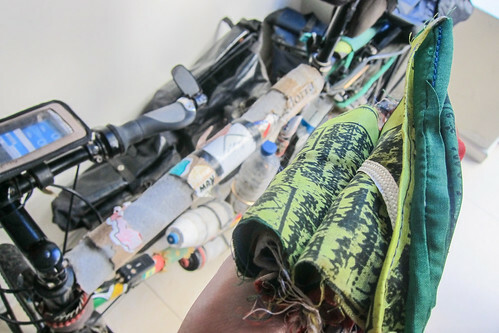 For example, since Senegal, I also carried Kuku‘s wristband made of Coca-Cola pull-tabs collected in the Sahara, of which I made a headtube-band. Cycling touring is in a way synonym with minimal travelling: everything transported takes some of the scarce space in the panniers, and its weight will directly impact how much I sweat and how much I eat. Therefore, I have to keep my luggage to the bare essentials. No need for two pairs of shoes when I can only wear one at a time. On this African trip, I did pretty well at packing efficiently and carrying only the essentials. 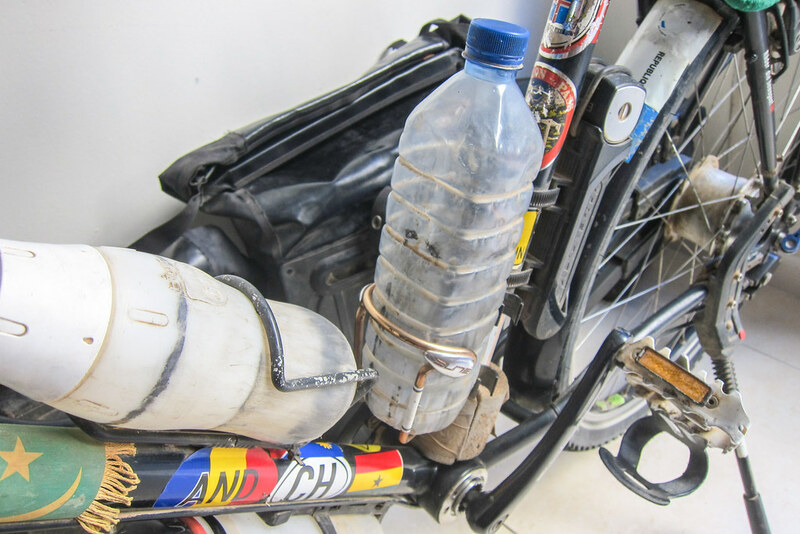 However, because I didn’t want to rely on locally sourced Indian boxes of medicine or Chinese spare parts, a substantial amount of space in my panniers was dedicated to these two categories of items that are rarely useful, except for the one time they are badly needed. 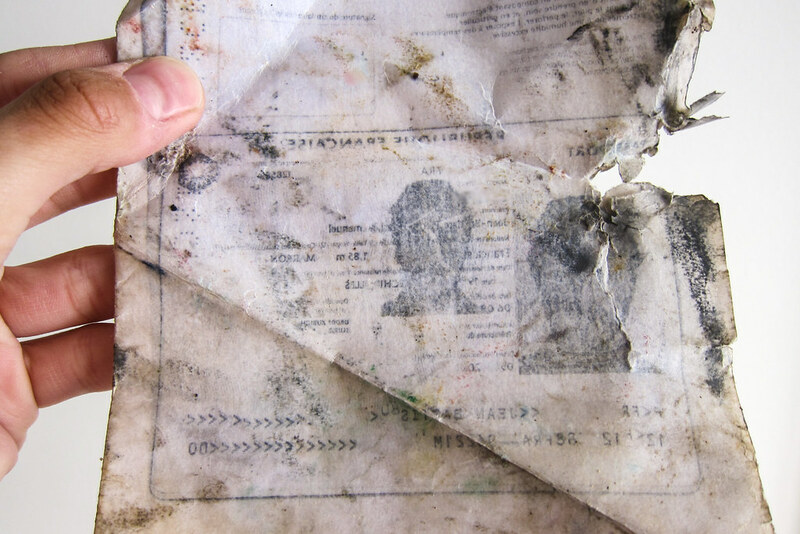 It’s not in the African bush that I am likely to find original Malarone, plasters that actually stick to the skin, or a Magura bleeder kit (not even in cities, for that one). Health (mine and the bike’s) are important enough to carry these things. Aline gave me Tibetan prayer flags in Lausanne, and I put them in my small saddle bag, with my bike multi-tool and tubes of superglue. I forgot about it for a long time. 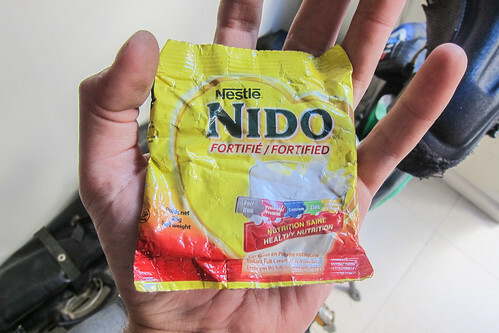 She also gave me vitamin-energetic sweets, that I placed in the same saddle bag, and removed them when I discovered mold many months later… I wonder if having a prayer flag on two wheels acts like a prayer wheel. I may have spread mantras all over Africa? It is unlikely that I would take the pain to heat water just to make milk. I think I bought milk powder to mix with oats at breakfast, but since it’s not in my habits, I forgot it at the bottom of my food bag. I didn’t mean to carry talismans from all possible religions, else I would have bought a khamsa in Morocco and that amulet directly from the Voodoo priest in Benin. The rosary was given to me by the boy scouts I stayed with in Andalusia. 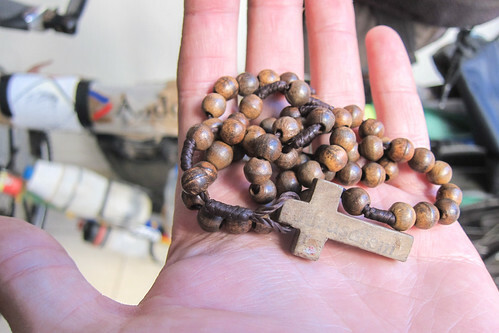 They said “just keep it in your pocket“, and with only one pair of pants, that rosary made its way until South Africa! This one is not a dispensable item, quite the contrary actually: the Hépar water plastic bottle lasted 26000 kilometers, thousands of refills, and countless insertions in the bottle cage. It fell, it rolled, it got smashed, but it survived! At the very end, there was a tiny leak: the bottle’s exterior would get moist when I pressed on it. The best is that green mold, which developed at the bottom of my “regular” bicycle bottle, and that I had to clean with bleach every 4-5 months, never appeared in the Hépar plastic bottle. 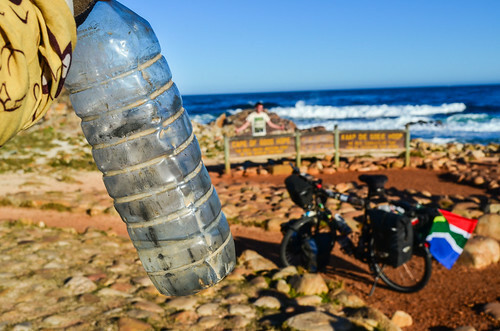 That says two things: 1) buying a $15 water bottle is not necessary when a free one lasts longer, and 2) in the first place, why do plastic bottles able to take a 2-year adventure are sold for a single use? When I broke my rear wheel skewer in Mauritania, the only replacement I found in Nouadhibou was a cheap pair of Chinese quick-release skewers. They were probably the only ones in town, and I felt super lucky. 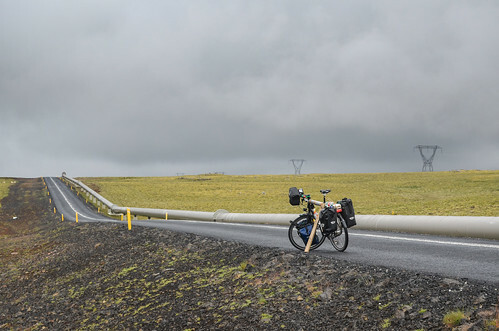 I bought them partly by exchanging a 28″ tube, another completely dispensable item that I carried for 8000 KM, since I have 26″ wheels. A skewer is like a pedal (one broke in Cameroon): it never breaks, you never carry spares, but when it breaks, you can go nowhere. As soon as I could, I got steel bolt-on skewers made not-by-Chinese. I never installed them, because nobody would think “QL skewer = easy wheel to steal”, and the Chinese one was holding the wheel correctly anyway. Apparently, a crappy skewer shaft is not a big problem, as long as the tension is enough to prevent the hub to move. 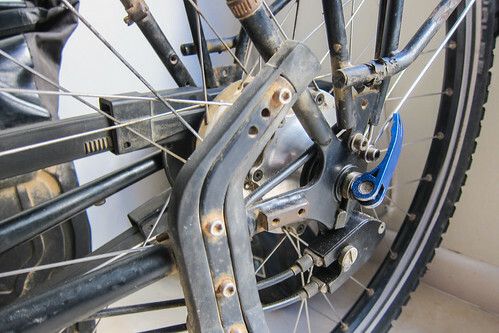 So since Senegal, I have carried 3 spare skewers, one of them hidden in the seat tube acting as a hook to retrieve spare spokes originally stored there. Yes, it is a thousand times more practical to use water instead of toilet paper. 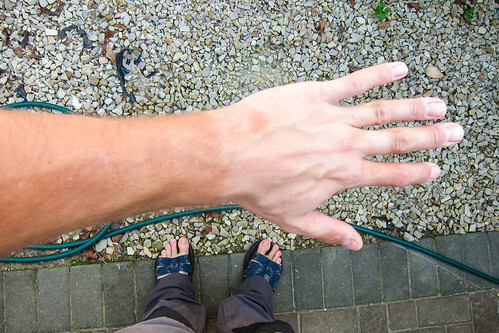 I think I got one roll for the Sahara, fearing that I’d have to choose between being thirsty or being dirty. But when I found it in Cape Town, I realized toilet paper was as useful as a rosary. Copies of passport are always useful and needed. I also had copies of some entry stamps, they are sometimes needed, and copies of everything that an Embassy can ask for while applying for visas. These ones were not in the most waterproof pocket. 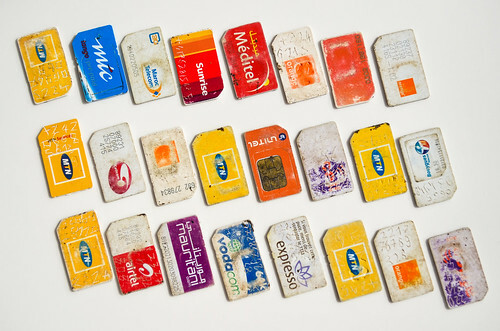 I’m glad I didn’t go for a roaming SIM card and a single number, roaming charges are simply outrageous in Africa, especially when local SIMs are costing close to nothing are sold on every streets. While in Benin, I have already written about telecom in Africa, and as reflected by my SIM card collection, MTN and Orange are the biggest players on the west coast. 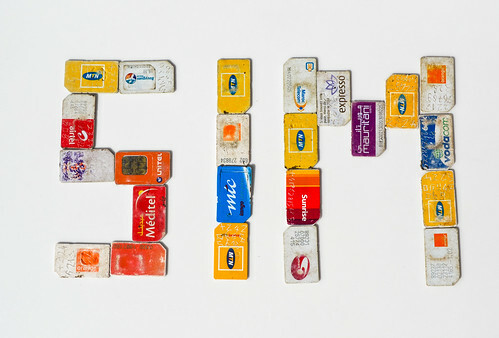 In average, I think MTN provides the most homogeneous and best service. I don’t know if hair is supposed to be of the same color from root to tip. It can also be that white hair sunburns. 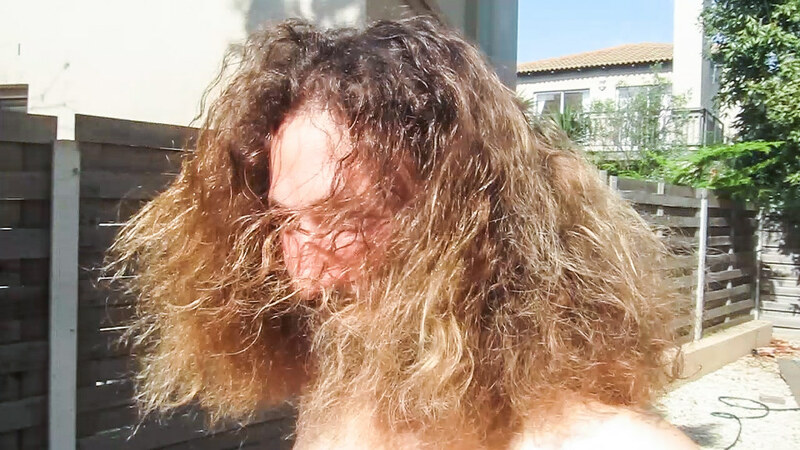 At least I have had natural blond hair once in my life!